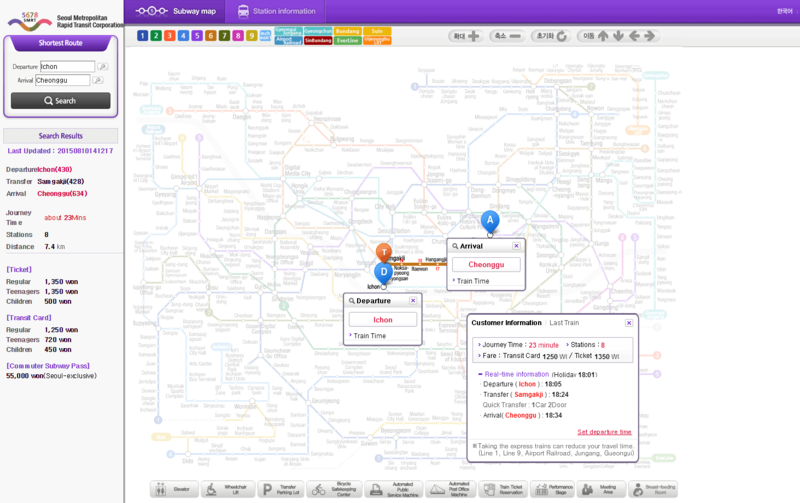 SMRT Subway Trip Planner (Cyber Station): Seoul Metropolitan Subway system is very complicated. There are so many different routes you can take to get from one station to another. If that perplexes you, leave it to the technology. 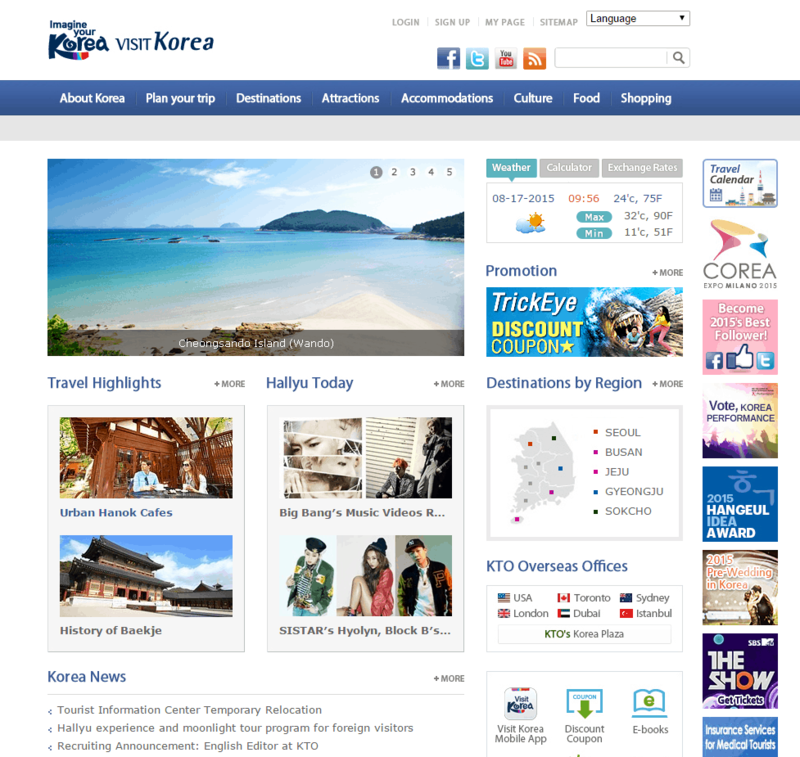 Available in Korean, English and Chinese, the website calculates the fastest way to get to your destination. Moreover, you will be able to retrieve useful information including estimated journey time, transfer station, ticket fare and time table for the train. 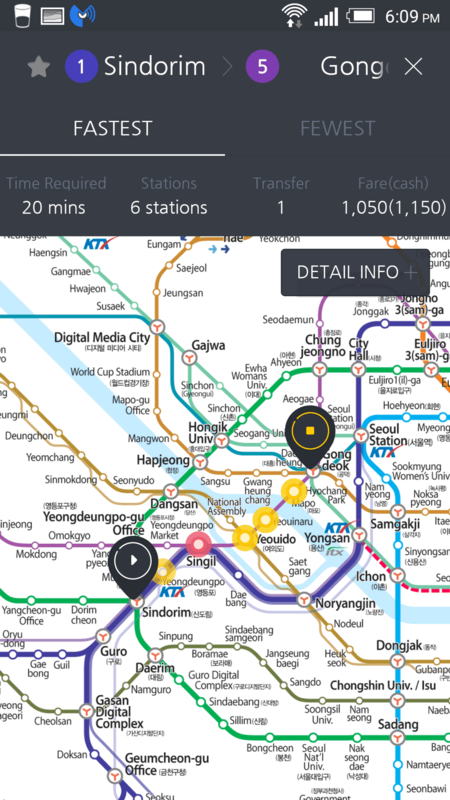 Subway Korea App: Have the Subway Korea App downloaded onto your phone will save your life! 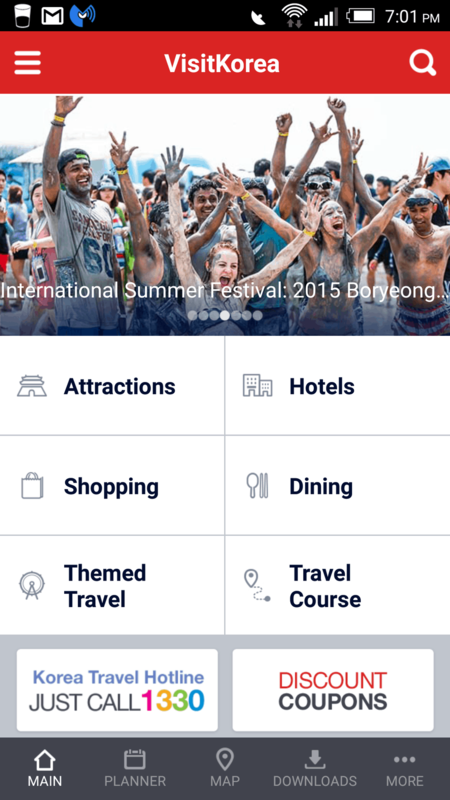 Similar to Cyber Station, this handy app helps you plan your trips. 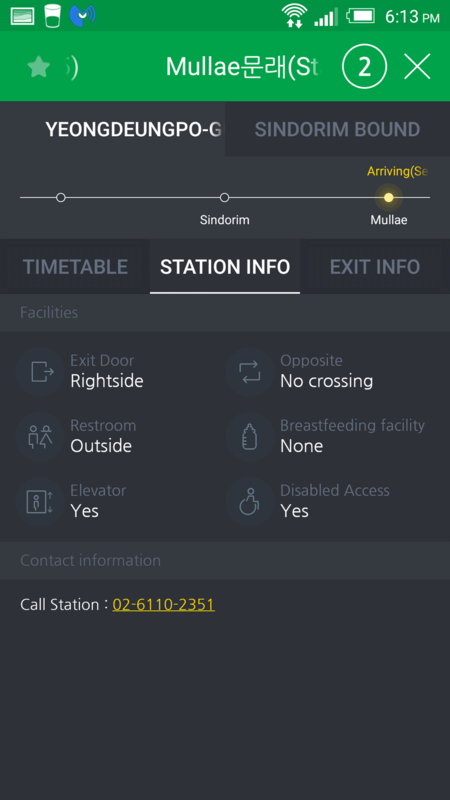 In addition to displaying the fastest and shortest possible routes, estimated journey time, transfer station, ticket fare and time table, it also has useful “station info” available! You can find out if the station allows opposite crossing on the platform, if there’s elevator or restroom, and which side to exit the train. What I liked most of this app is that it has live update on where the train is currently at! Naver Map & App: If you need to find where a specific location is with a Korean address, use Naver Map. Google Map is not helpful at all in Korea. Although Naver Map does not have an English or Chinese version, it is pretty self-explanatory to use. Follow the instructions in the pic below and you’re be able to find your way around Korea! 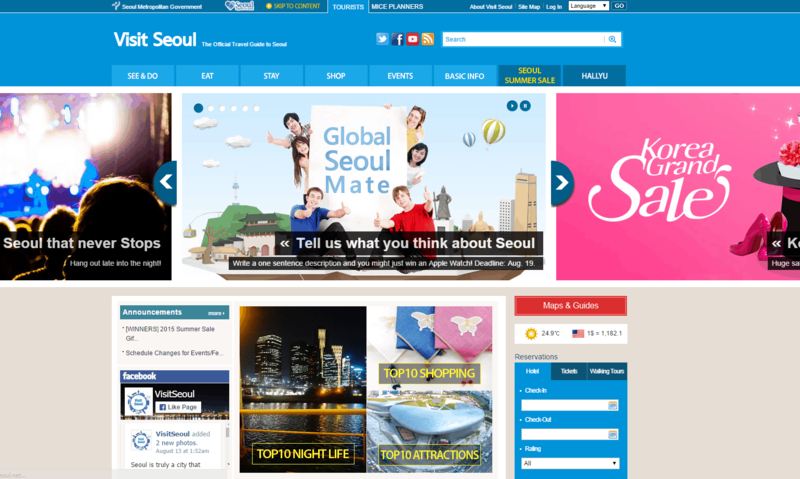 Visit Seoul: If you’re planning to tour around Seoul, Visit Seoul is your saver! This is an official site maintained by the Seoul Metropolitan Government, introducing foreigners to places where they can eat, stay and shop as well as must-see’s and must-do’s in Seoul. Before you dive into all the other content, I would recommend checking out the Maps & Guides section first. Those guidebooks might help you narrow down what you are interested in seeing . Not to mention that those maps are super beneficial to independent travels to cruise around the city! Konest 韓巢: For Mandarin speakers who are more comfortable with Chinese, Konest is all you need. It has EVERYTHING you need to know about visiting Korea. From the basics (exchange rates, travel visa, transportation, tax refund procedure) to hotel booking and restaurant recommendation (with prices and Chinese menu available), you have all you need in one site! 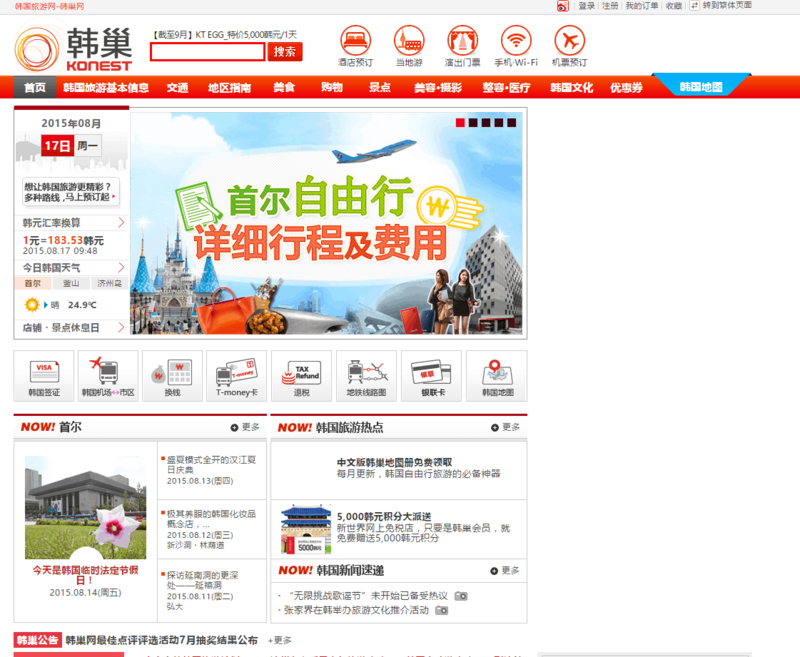 Also, can you believe that they have a Chinese map navigation platform in Chinese?? That’s craaaazy!! As a foodie, I liked to check out restaurants in advance and see what previous visitors said about the food. Sometimes, they have coupons for specific restaurants or stores! 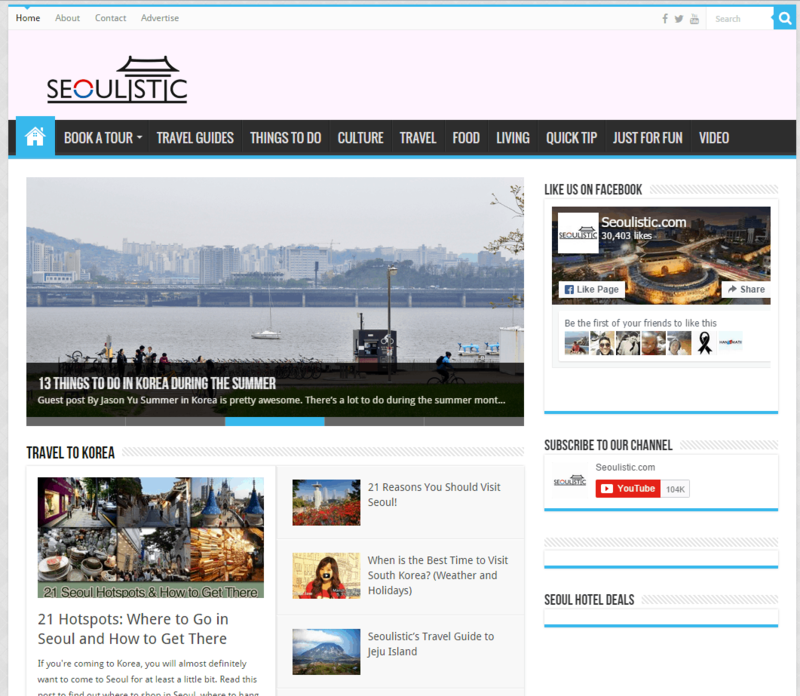 Seoulistics: This is a culture and travel site organized by Seoul locals, sharing cultural tips, travel tips, places to eat, things to do and various other information. I would go on this site for “insider tips.” Those I found useful include 6 Seoul Subway Shortcuts to Tourist Attractions, Best Bibimbap Restaurants in Seoul, and Beginner’s Guide to Korean Street Food. Of course, there are plenty other resources you would find as you plan your trip, but those are the basic ones I would begin with. Before we conclude, I would strongly recommend you rent a WiFi router in Korea. It’s true that many coffee shops and stores have free WiFi you can connect to, but not every place has it. Spend a few bucks to save you all the hassle. A few telecom companies offer wifi router rental services (KT Olleh, SK Telecom). I booked mine 2 weeks before my trip with Pocket Wifi Korea. Easy, non-expensive, and smooth internet connection! Great tips for visiting Korea, Cat. I’ve never been anywhere in Asia and your post is really where I should start for planning a trip in this part of the world. So true about the frustration of trying to convey to someone who doesn’t speak English where you want to go, I have been offered kind advice and steered toward the wrong train. So these tools are helpful. That’s why pre-trip research is so important when it comes to visiting non-Engilsh (or Chinese) speaking countries! Cat, I always start with the public transportation as well. That and a good mapping app to give me the lay of the land. Great tips! Taxis can be sketchy when traveling in Asia (not so much Korea and Japan, but SEA and other less developed countries). That’s why I tend to stick to public transportation too. Great tips! I was a bit nervous when I visited Shanghai (and I was by myself) but the research I did before the trip helped me a lot. Then, when I was there, I felt at ease. So true, Ruth! I panicked a lot when I landed in foreign land. I ALWAYS do my homework beforehand. This is a super helpful post. I would have been a little intimidated about travelling in Seoul but not any more. Glad it is helpful to you, Jan! Super useful post, Cat. You’ve managed to make visiting Seoul easy for those of us who don’t read or speak fluent Korean. 🙂 Thanks for sharing it on #TheWeeklyPostcard. These are great tools to be aware of before traveling to Korea. We have never been to Korea and hence this is useful information for us. Especially the Subway trip planner and app. We always make it a point to use the public transport in the cities we visit as it is a great way to understand the life and also interact with the locals.